Originally from Chisinau, Moldova, Dr. Peterson grew up in Indiana and graduated from Purdue University School of Science with a BSc. degree (Honors) in biology with a minor in chemistry. She had an opportunity to participate in research involving glioblastoma stem cells while in college and it was at that time when her interests in neurosciences and neurosurgery had evolved. 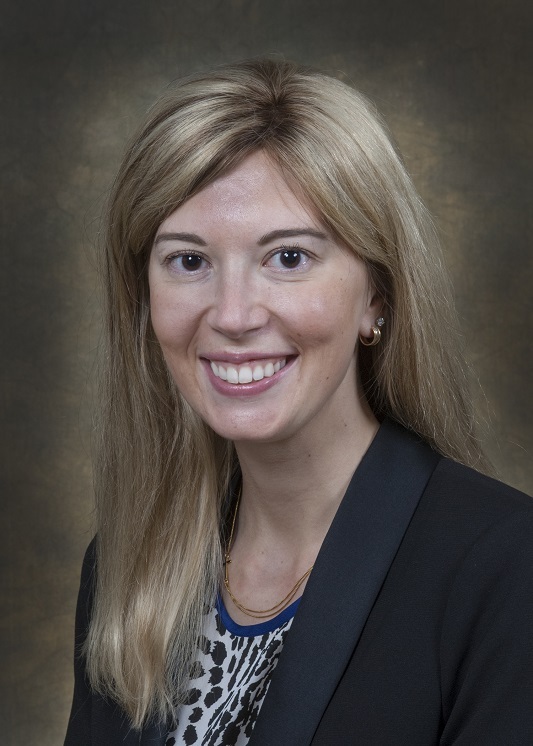 After graduating from Indiana University School of Medicine, Dr. Peterson began her neurosurgery residency at Wayne State. She is passionate about research and helping the underserved population. In her spare time, she enjoys running, biking, volleyball, and acrylic painting. Peterson C, Elswick C, Diaz V, Tubbs RS, Moisi M. (2017) Delayed presentation of cerebral air embolism from an atrial esophageal fistula: A Case report and review of literature. Cureus 9(11) doi: 10.7759/cureus.1850. Peterson C, Garling RJ, Asano E, Kupsky W, Set K, Agarwal R, Sood S. (2017) Successful surgical treatment of refractory status epilepticus in a twelve-day-old infant: Technical note. Manuscript submitted for publication. Peterson C, Garling RJ, Haridas A, Moisi M. (2017) Delayed presentation of anterior arch C-1 fracture in a six-year-old child: A Case report and review of the literature. Manuscript in preparation. Peterson C, Marupudi N, Wang ZJ. (2017) A novel chromosomal translocation finding in a child with neurocutaneous melanosis syndrome: A Case report and review of the literature. Manuscript in preparation. Kovanda TJ, Pestereva E, Lee A. (2016) Intrathecal baclofen pump migration into the peritoneal cavity: A case report. Anesth Pain Med 12;6(3) doi:10.5812/aapm.33031. White IK, Pestereva E, Fulkerson DH. (2016) Transfer of isolated linear skull fractures in the pediatric population: Is it worth the cost? J Neurosurg Pediatr 1 (1-5) doi: 10.3171/2015.9.PEDS15352. Kanakasabai S, Pestereva E, Chearwae W, Gupta SK, et al. (2012) PPAR gamma agonists promote oligodendrocyte differentiation of neural stem sells by modulating stemness and differentiation genes. PLoS ONE 7(11) doi:10.1371/journal.pone.0050500. Pestereva E, Kanakasabai S, and Bright JJ. (2012) PPAR gamma agonists regulate the expression of stemness and differentiation genes in brain tumor stem cells. Br J Cancer 106; 1702-1712 doi:10.1038/bjc.2012.161.